I don’t know if there is a profession that is more delectable to movie madmen, stalkers, serial killers, and monsters, than that of the babysitter. If you are a a lone, attractive female looking to make a quick buck, then you can watch over some brat kids for a measly $5-$10 per hour, and there is at least a 10% chance that your night is going to turn into a sequence of horrifying events! It doesn’t sound like a very good deal, but characters in films don’t always make the best decisions, and as a result, the horror film world has been saturated with banal babysitter brutality for decades. That’s why I’m very happy to report that while The House of the Devil utilizes the babysitter cliche, it separates itself from the crowd of generic slashers that also depict the horrors of the babysitter. The House of the Devil is the third offering from young horror director Ti West and features a great cast. The film stars Jocelin Donahue as Samantha, the babysitter, and Greta Gerwig as her friend Megan. Add to this, Tom Noonan, Mary Woronov and AJ Bowen as a variety of suspicious characters and the audience is in for a treat. The story is set in the 1980’s and begins with the adorable Samantha securing an apartment that she desperately needs. However, she only has a few days to come up with the $300 deposit or else she will be stuck with her inconsiderate roommate, who is more interested in sleeping with her boyfriend than hitting the textbooks. A fortuitous glance at a school message board discovers a babysitter job. Samantha, without a dollar to her name, inquires into the position and is told that there is work for her tonight, if she wants it. It’s a relatively easy decision. Samantha and her friend Megan set out in Megan’s car into the countryside at night, to check out the babysitter position. Unfortunately for them, the film is not called The House of the Babysitter. One of the main points of praise that I have read about The House of the Devil is that the director has done a great job of re-creating the feel of horror movies from the 70’s and 80’s. I agree with this point, but it is not what impressed me the most. What I really enjoyed about the film was the uncertainty of when, or if, I would be scared or shocked. Many horror films let the viewer know from the very first scene if the film is meant to be a casual horror film, an extreme exercise in terror, or somewhere in between. I had a very difficult time getting a read on The House of the Devil until it was over, and this was a very good thing. Too many times horror films are not as successful as they could be, because of audience expectations. If a zombie eats someone’s brain in the first five minutes, the audience mentally prepares for worse acts of horror in the following scenes. The House of the Devil greatly succeeds in leaving the audience unprepared by utilizing a very well timed gradual buildup to the horror. I will not spoil the fun and say whether the film is relatively tame or shocking, just that it is a fun ride. The cast do a great job. Tom Noonan, who towers above the college girls, and Mary Woronov are subtly creepy and really help to create the atmosphere of uncertainty. I’m looking forward to seeing Jocelin Donahue in another lead role sometime soon. I’m also excited to see AJ Bowen in You’re Next at TIFF in about a week. The soundtrack is appropriate and sounds like something I would throw in my Walkman if I got the chance. 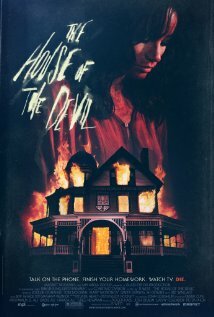 The House of the Devil is not a perfect film, but it has a lot of positive qualities, from the atmosphere to the acting, that really make it worth checking out. If you end up enjoying the film then keep an eye out for Ti West’s next entry in his unofficial trilogy of terror, The Innkeepers.